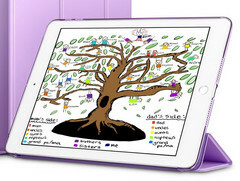 The slate tablet continues to sink while detachables steadily grow to take its place. Apple, Samsung, and Huawei were collectively responsible for over 55 percent of all tablets sold worldwide during the first quarter of 2018. Convertible notebooks, or systems that can twist, flip, or spin, have not been included in the data. The news comes just days after rumors of Q2 2018 being yet another low for the tablet market. 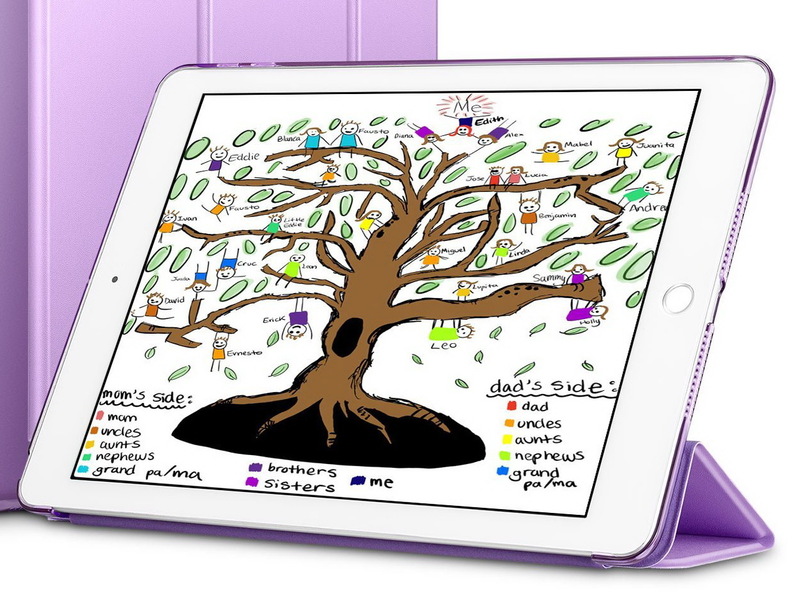 It's well known by now that the tablet market has been on the decline. Now, the latest preliminary quarterly figures from market analytical firm IDC paint a similar picture - if not worse. According to the firm, global shipments of tablets and detachables as of Q1 2018 have dropped 11.7 percent YoY from 35.8 million to 31.7 million. The hardest hit are Samsung and Amazon who managed to ship 11.4 percent and 49.5 percent fewer tablets YoY, respectively. Interestingly, IDC has noted that detachables have been gaining traction in contrast to the slow demand for traditional tablets. 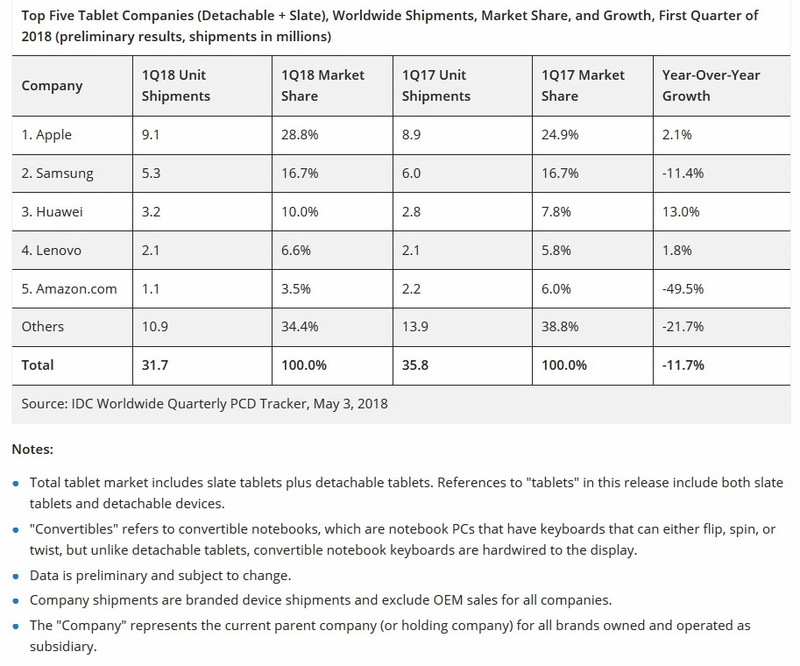 Devices with detachable keyboards like the Microsoft Surface or iPad Pro grew more than 2.9 percent YoY for a total market share of 15.3 percent. Meanwhile, traditional tablets dropped by 13.9 percent to only 26.8 million units shipped. Thus, while the detachable form factor is promising, it is not growing anywhere near fast enough to make up for the tablet deficit. 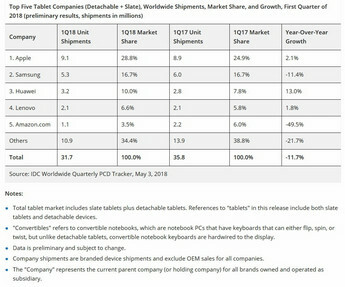 Apple is still the undisputed leader in terms of tablet market share as the manufacturer is responsible for over one-quarter of all tablets sold. Its grasp on the market is larger than the next two largest manufacturers combined as shown by the table below. Of the 9.1 million iPads shipped this past quarter, 1.8 million were iPad Pro systems. 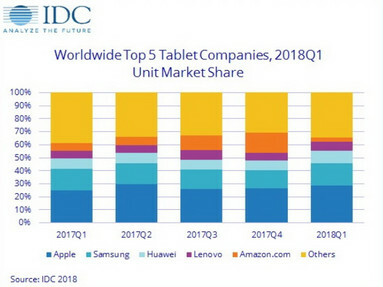 Huawei may eventually inch closer to take second place with its well-received MediaPad series of tablets should Samsung continue to slump.